Trip Highlights: Stand at the top of the world after breaking ice to get there. 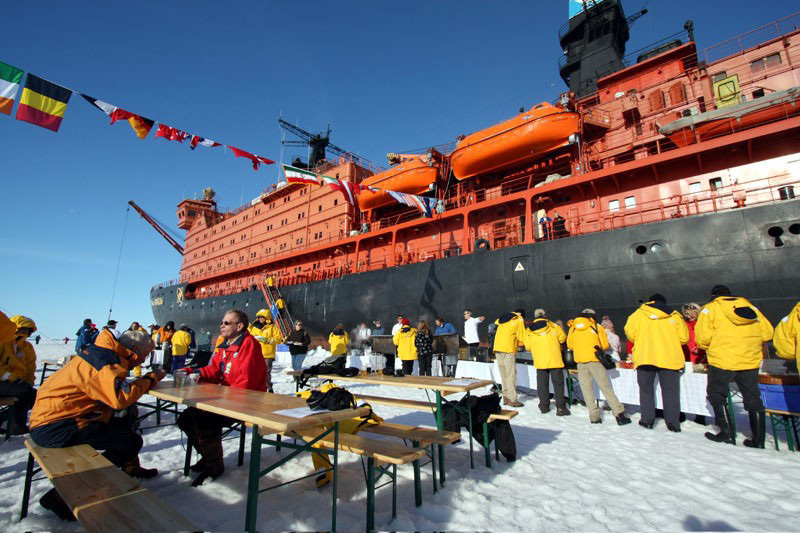 This expedition leaves via Murmansk in Northern Russia and heads straight to the pole where you can get off the ship onto the ice, have a glass of champagne and BBQ in celebration. 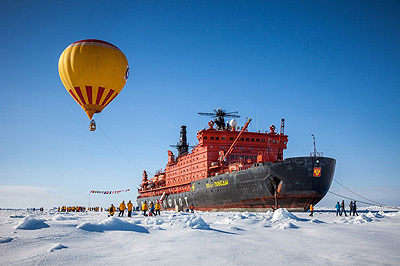 Tethered balloon flights are another possibility weather permitting as is a polar plunge into the sea!. Rarely visited Franz Josef Land is on the itinerary on the way back, helicopter flights give you an aerial view of the ship doing what it does best - breaking ice. Rate Includes: Helicopter aerial sightseeing; a complimentary selection of beer and wine, and non alcoholic beverages on board during lunch and dinner; downloadable photographic journal; a pair of waterproof expedition boots on loan; an expedition parka - yours to keep. Subject to change without notice. Hot Air Ballooning: $495 per person. Note - the 14 day June departures leave and return to Helsinki, Finland. The 13 day July departures leave and return to Murmansk, Russia. Just six degrees south of the Arctic Circle is a sophisticated city with nightlife, green spaces and a breathtaking harbor. Stay at a centrally-located hotel. 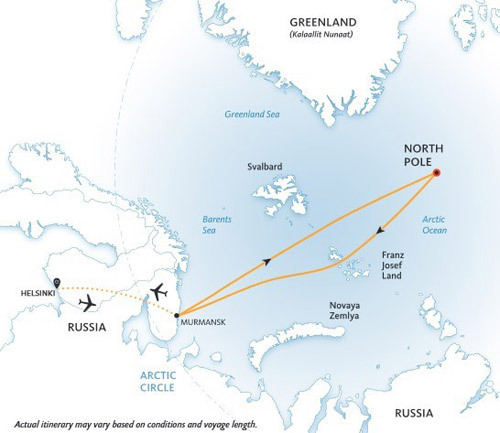 From Helsinki, a charter flight will take you to Murmansk, Russia to embark on your voyage to the North Pole. 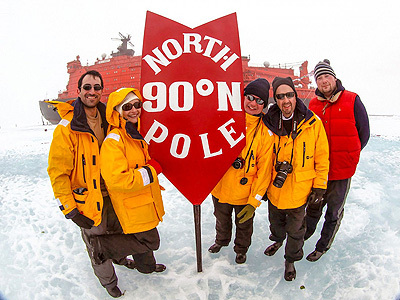 Enjoy time to get acquainted with fellow passengers and the expedition ship - the world's largest and most powerful icebreaker! 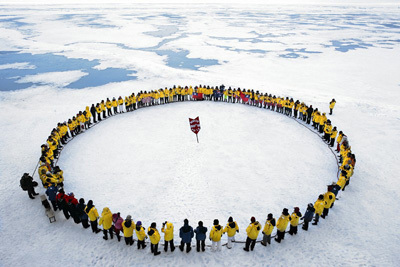 Watching the Victory crush through the Arctic ice pack is an incredible sight, made even more memorable by taking a helicopter flight for a thrilling aerial view of the Victory and expansive Arctic Ocean. Expect the days, and hours, to present variable sailing conditions this far north. 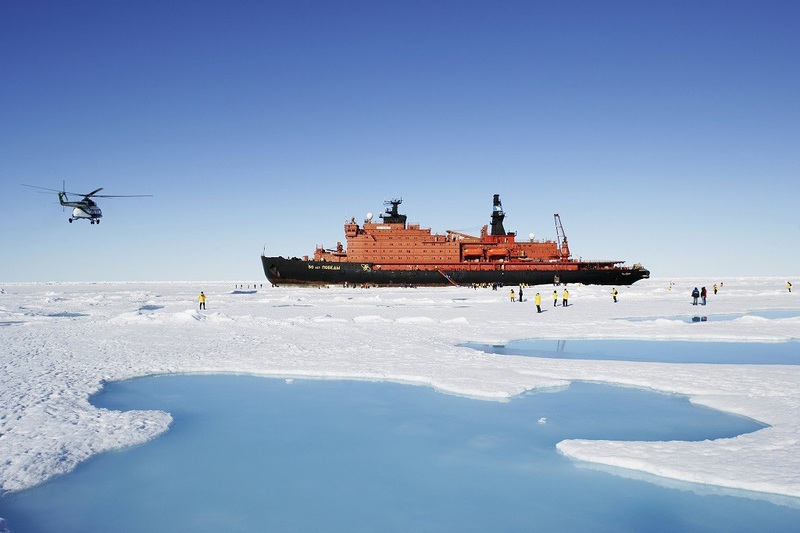 The crossing from Murmansk to the North Pole can take anywhere from 5 to 8 days, meaning plenty of time to get to know fellow shipmates, enjoy the vistas of the wild north, have a drink at the bar, go for a swim in the ship's lap pool, or shoot some hoops on the basketball court. All the anticipation of the prior days reaches a climax as you reach the North Pole! Many travelers find themselves overcome with emotion, while others are in a festive and celebratory mood. Take photos, wave a flag, enjoy your moment. Rise high in a hot air balloon to commemorate this great moment (optional activity, fee applies & weather dependent). Later, everyone enjoys a champagne toast and a BBQ on the ice. Perhaps take a polar plunge. Head southbound toward Franz Josef Land. Everything from here on out is a bonus. 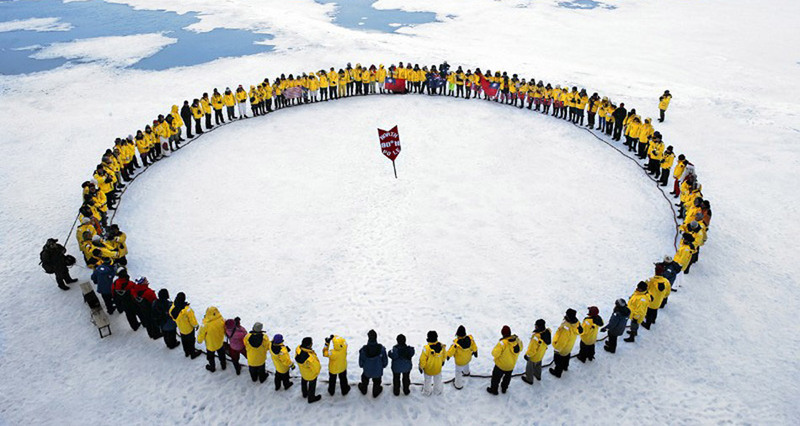 As you head further south, you may get lucky and spot polar bears hunting for seals. This group of 191 islands forms the most northerly archipelago in Eurasia, and lies entirely within the Arctic Circle and so remote that Franz Josef Land was discovered after Antarctica. Explore Cape Flora, and discover historic remains from three ill-fated Arctic expeditions. 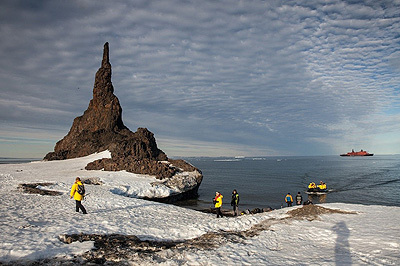 When conditions permit, Zodiac trips beneath towering cliffs will explore remote seabird colonies. The 50 Years of Victory helicopter will provide aerial sightseeing and our Zodiacs will transfer you to seldom-visited landing sites. Crossing the Arctic Ocean back to Murmansk. Take time to relax and enjoy the ship's amenities or watch the ocean and sky for wildlife from the observation lounge or outside decks. Returning to Russia's most northerly city, bid farewell to the expedition crew and ship. Transfer to the airport for a charter flight to Helsinki, Finland to enjoy one final night in this remarkable city. Your journey has officially come to its conclusion. Consider extending your stay to further explore Helsinki and the surrounding area before your return home. Read this itinerary as a guide only; the exact route and program varies according to ice and weather conditions - and the wildlife you encounter. Flexibility is the key to the success of this expedition. All guests are required to have comprehensive travel insurance coverage. Due to the remoteness of the areas in this itinerary, travelers must have a minimum $50,000 of emergency medical coverage. Proof of coverage is required prior to embarkation. The shipping company will not be held responsible for delays due to force majeure. Any additional costs accrued will be the responsibility of the traveler. We strongly recommend that the travel insurance policy covers trip cancellation insurance, trip delay (interruption or after departure coverage), baggage and repatriation. We can assist you with this. Not included in cruise rate. Pre-booked option for up to 50 guests. Hot air ballooning must be booked at time of reservation. Each tethered hot balloon flight will be about 15 minutes in duration. A certificate will be provided as a memento. Shipboard accommodation with daily housekeeping; all breakfasts, lunches and dinners on board throughout your voyage; a complimentary selection of alcoholic and non alcoholic beverages; Zodiac transfers and cruising; downloadable photographic journal; a pair of waterproof expedition boots on loan for shore landings; an expedition parka - yours to keep; coffee, tea, cocoa available around the clock; miscellaneous service taxes and port charges; luggage handling aboard ship; group helicopter flightseeing according to daily program; emergency evacuation insurance for all passengers to a maximum benefit of $100,000 per person*. Subject to change without notice. Airfare; mandatory charter airfare package; passport and visa expenses; government arrival and departure taxes; any beverages that are not in the complimentary selection; meals ashore unless otherwise specified; baggage, cancellation, interruption and medical travel insurance; excess baggage charges; laundry, bar and other personal charges; phone and internet charges; gratuity for ship's crew and Expedition Team members; hot air balloon option; extra helicopter flights beyond included; fuel surcharge may apply. Emergency evacuation coverage to a maximum benefit per paying passenger of $100,000 is included in the cost of this expedition. Included coverage is applicable only to travel between the first and last day of the expedition purchased. Additional days of travel prior to the expedition and/or after the expedition are not covered by the included emergency evacuation insurance. We strongly advise all passengers to purchase medical, cancellation and baggage insurance, and additional emergency evacuation coverage.